The ProMed Specialties PM-720 TENS / EMS Combination Unit is a 2-in-1 unit for the soothing of nerve spasms and muscles. The TENS part of the system stimulates the nerves that spasm, causing you discomfort. The unit has 6 TENS modes to select from; depending on the type of electrode pulse you prefer. Included with your unit is also 4 self-adhesive reusable electrodes to place around the area you want to stimulate. When operating your unit, you can set the voltage to a setting you can tolerate where you can feel it slightly without causing you harm, this helps ease your nerves after a long day at work or the gym, helping you relax faster. There are 9 preset programs in the unit for either the TENS or EMS selection for a quicker selection of your choice of pulse. 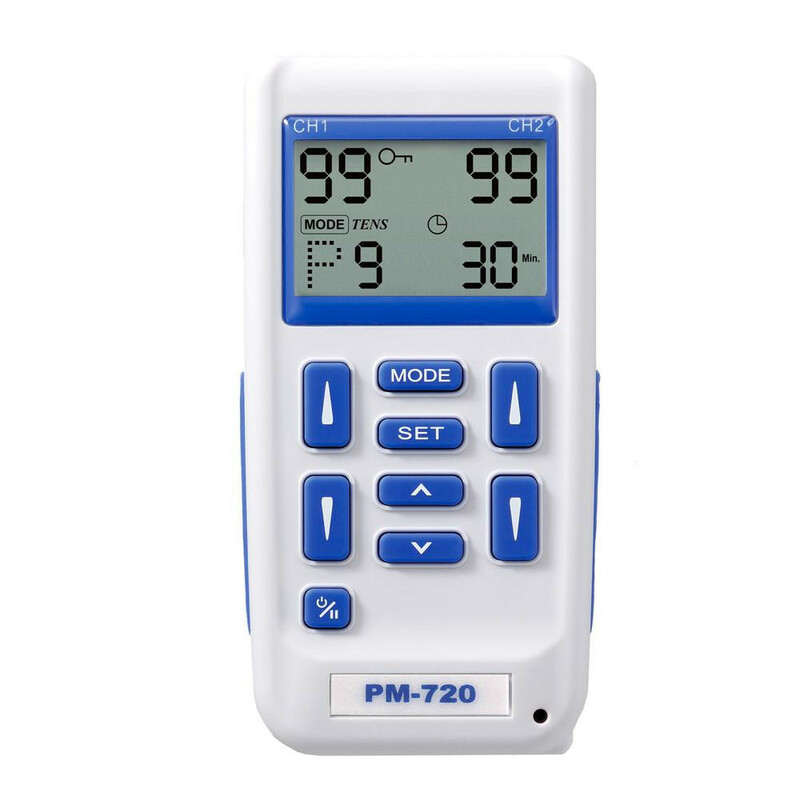 The adjustable timer feature sets to the pulse and changes the frequency of the unit, depending on the option you select - reducing the need to constantly reconfigure your unit. A large LCD display reads the level of battery left on your unit and the settings you have it at. The system is portable and does not rely solely on an AC adapter, it comes included with a rechargeable 9-Volt battery that can be used to power your unit in place of the AC adapter; in case you forget your power cord. When using the EMS setting, you have the opportunity to help relax not your nerves this time, but your aching muscles now, muscles that have been used throughout the day and are sore and torn. When using the EMS, you stimulate the muscle tissue helping it contract and relax in a continuous cycle. When using the EMS setting on your muscles it actually helps repair the torn fiber tissues, tears happen when you use your muscles past your limitations in strength or repeatedly. Always prep and clean the area on your skin where the electrode pads will be making contact on, this will help the life of your pads adhesive. "Feel Good Item" because I feel good after a treatment. Can't say for long term, but short term has been great. Nice to have treatments at home on your schedule. Pre-sets make use very simple. No problem with order and I just place order for supply of pads from the same company. 9-volt battery easy to install, no tiny wires to break. Started to knock off 1 star because it only came with small pads, but unit works so well I didn't.